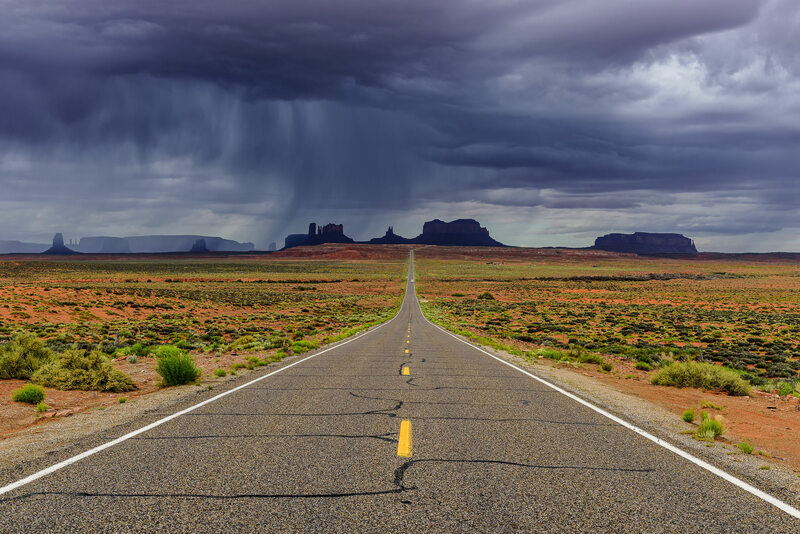 Directions: Monument Valley is located in the Navajo Indian Tribal Park, which straddles the Arizona-Utah state border. The entrance to the park is from rt. 163 on the very southern edge of Utah, but the park itself resides in Arizona. 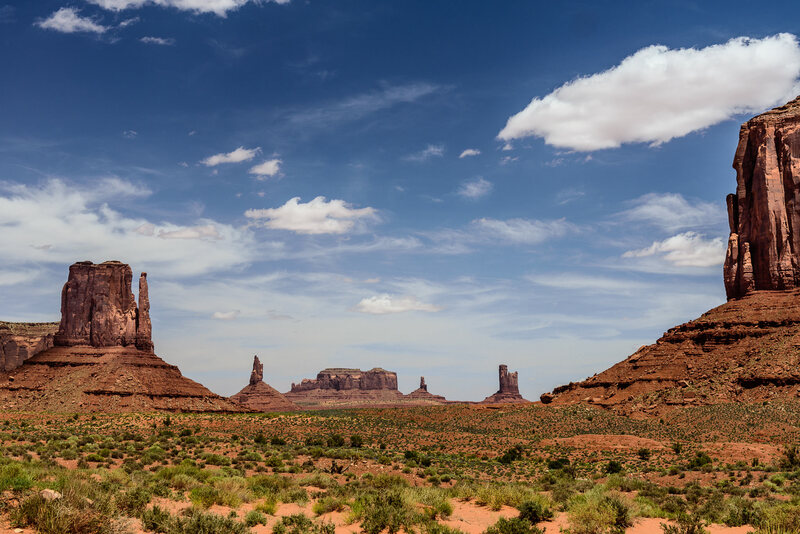 There is one hotel in Monument Valley, The View hotel, which is run by the Navajo Nation. It’s located adjacent to the Visitor’s Center, which you’ll encounter when you enter the park. It gets its name from the fact that every room has a spectacular view of the most-recognized part of the Valley – the left and right ‘mittens’, and Merrick Butte. There is a single, 15-mile dirt road winding through the valley which you can drive on. You cannot depart from this road without a Navajo guide along. You’ll find yourself stopping every few hundred yards to gawk at the scenery and take photos. As you’d expect, sunrise/sunset is the best time to photograph, but you can still get spectacular images just about any time of day. During the summer the temperatures can get quite high, so you might want to visit during a cooler time of year. Most of the time the weather is sunny, but if you encounter rain, you can also get some very memorable shots. If you sign up for a ‘photo tour’ with one of the guides (who are located just outside the View’s parking lot), they’ll take you to spots not open to the general public. They’re not the ‘iconic’ spots everyone takes a picture of, but they’re every bit as spectacular, if not more so. My recommendation would be to sign up for a tour ; make sure it’s a ‘photo’ tour, so the guide will take you to the most photogenic places. As for gear, you’ll probably want a wide-angle zoom (16-35mm, or 24-70mm, or so) for the landscapes. A telephoto zoom (70-300mm or so) will be useful for details of the buttes, etc. Since you can’t leave the road (or the parking spots along it), zooms, rather than primes, will allow you to frame the shots ‘just right’. If you’re not shooting too wide, you should use a circular polarizer during the daytime. It will be bright in the desert, so you may be able to get by without a tripod, even at small apertures (e.g. f/16). Thank you for this brief but thoughtful post. I’m headed out in November and I will use the local hotel, and get a tour per your suggestion. Good luck, Scott. I’m sure you won’t be disappointed. 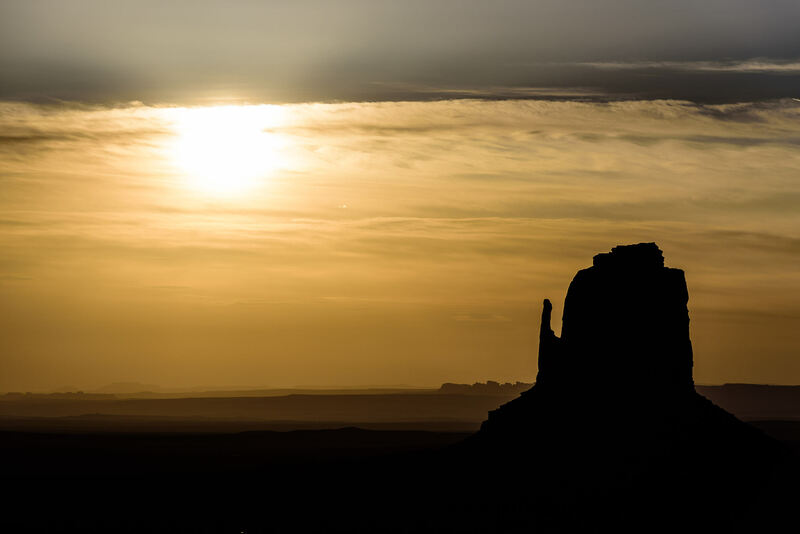 Don’t miss the opportunity to visit Goulding’s Lodge at Monument Valley which is the historical site and what made Monument Valley know to the world. Goulding’s Lodge is a full service location also – www.gouldings.com Tours for photography in many areas are available. That sounds like it’ll be a very memorable trip indeed. Yellowstone and the Grand Tetons are on my bucket list. One suggestion: since you’ll be in the area, if you have the time you should consider visiting Dead Horse Point State Park also, which is near both Arches and Canyonlands National Parks. It’s smaller than the other parks, and you can see most of it in a couple of hours, but the views are jaw-dropping. Good luck. I’m sure you’ll come back with beautiful shots.